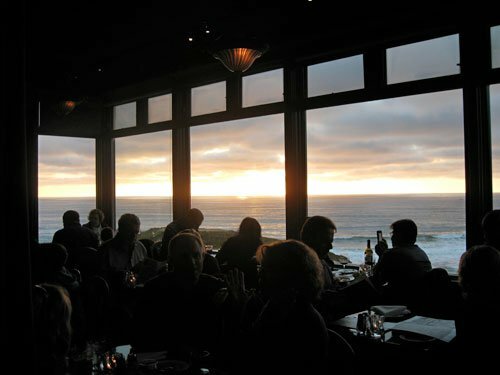 On the approach to this Half Moon Bay mainstay, you find yourself wondering why there is a restaurant “way out here.” Then the wow factor hits. The Spanish-style building nestled on a craggy cliff above the wild Pacific is nothing if not impressive, all the more so when you enter its window-walled dining room. And then there’s that sometimes sunny, sometimes wind-swept (and always pet-friendly) patio, with its cozy blankets, fire pits and spectacular ocean views. Menu-wise it’s standard fare at these types of ocean-side spots: seafood platters, fish tacos with light-as-air homemade tortillas, and giant juicy burgers thrown in for the “turfers.” But it’s the history of the place that really seals the deal. Turns out the location couldn’t have been more ideal when the place opened in 1927—during Prohibition. On that secluded beach, under cover of fog, Frank Torres made clandestine trades with Canadian rum-runners, and his speakeasy, “Frank’s Place” quickly became a popular nightspot among the San Francisco glitterati (including mystery writer, Dashiell Hammett, who set a story here).